You can call Carnival queen slot a sequel to Pink elephants. However, that’s only particular true, as there are no symbol upgrades. Instead, there you can find an unlimited growing multiplier. You grow it and wait for a full line of the premium symbol. It’s a fun slot when you play it, as there some big wins you can hit even during the base game. 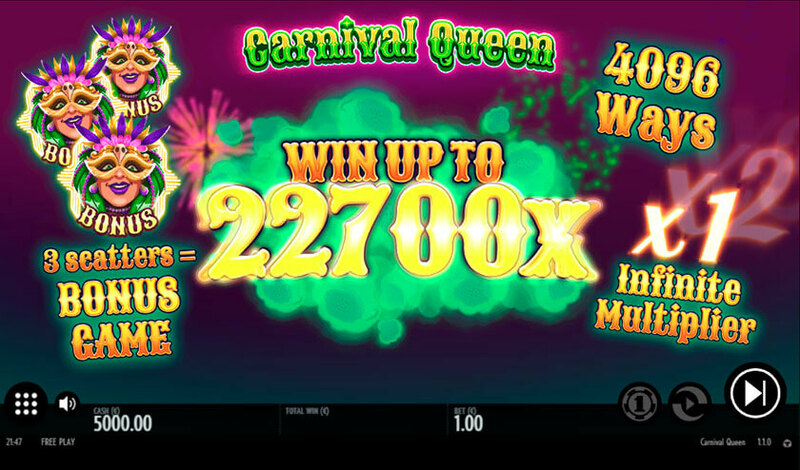 You can try Carnival Queens slot for free now and join a stunning brazil carnival show, where you can get 3 scatters and start your bonus rounds. The bonus game is all about growing multiplier and catching premium symbol, and if you land many crowns, you can win a huge up to win 22700x. Carnival queen is another Thunderkick slot that you can trust. It has everything you need to win big and enjoy your casino deposit. Excellent Thunderkick slot to try.